I woke up with the light peaking in through the curtains, illuminating the tiny glass shards on the floor. I looked at them in confusion. Suddenly I remembered what happened. Instinctively my hand went to my bandaged toe. Feeling where Carlos had removed the piece of glass. I was too tired to clean up the glass after Carlos left. The moment we had left me oddly excited but a bit confused. He wants to be my friend and he has made it clear that, that is all he wants... and yet everything else he does tells me otherwise. And to be honest I don&apos;t have an extensive knowledge about guys. 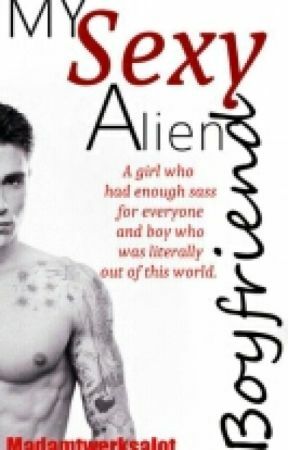 Let alone alien guys. The way he touched my hair and ran his hand along my arm... and looked at me with a certain tenderness, left me feeling like my heart was opening. When I was trying desperately to close it. But how can I be feeling this when I know next to nothing about him? It&apos;s his looks, it&apos;s just attraction is what I told myself. What else could it be? I was gonna give him exactly what he wants, and probably all I have to offer, friendship. But my stupid female brain didn&apos;t agree with me and my face flushed as I recalled his gaze slithering down my body and landing on my Teen Titan shorts. Those deep emerald green eyes.The embarrassed part of me wanted to burn the shorts and never see them again but the other part of me wanted to wear them to school every. Eliza snap the hell out of it! I have to get ready for school. My phone buzzed and I grabbed it off my night stand. My Smexy BestFriend: Hey chika what u gonna wear today?? My Smexy Best Frieind: That&apos;s cute. imma wear sweats and my uggs. I rolled my eyes. I swear this girl always wears sweats and Uggs. And when I ask her why she says " Why not, I&apos;m not dressing up for anyone." Why would she need to when she has a boyfriend who loves her to death. But don&apos;t get me wrong Gianna is gorgeous. And a huge flirt. And we&apos;ve been friends since kindergarden.